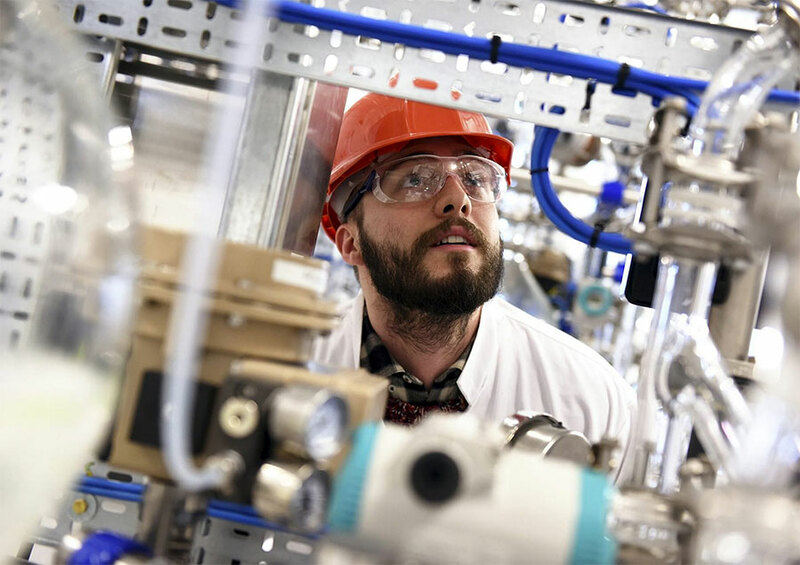 By joining Teesside University’s chemical engineering degree you will be on a path to full registration as a chartered engineer with one of the highest earning potentials amongst the engineering professions. Chemical engineers take science out of the laboratory and into the real world. They turn raw materials into useful products through changing their properties or changing how their properties interact with each other. 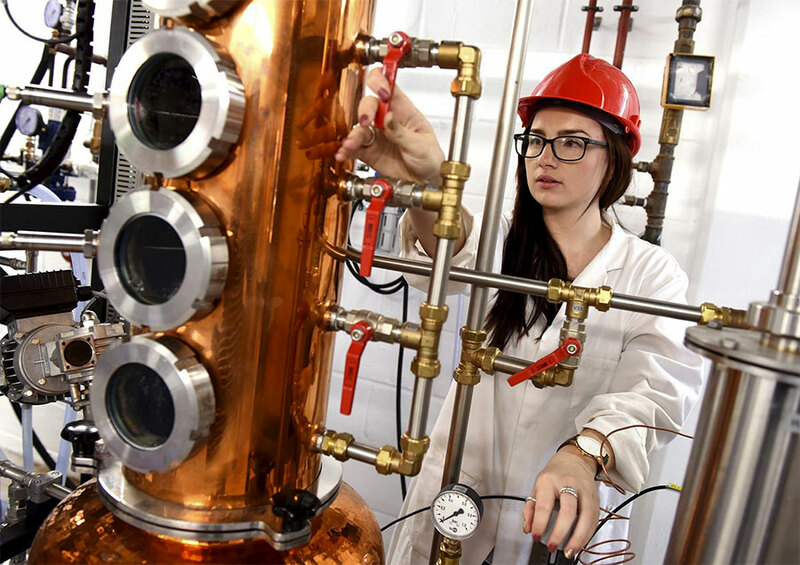 The North East is a major centre for process industries and this degree programme takes full advantage of the University's location by providing you with significant practical elements and opportunity to engage with industry. You may also benefit from a placement or professional mentorship with one of the companies in the region, or further afield. This is a real bonus, giving you experience of finding practical solutions to real industrial problems, and enhancing your employability prospects. 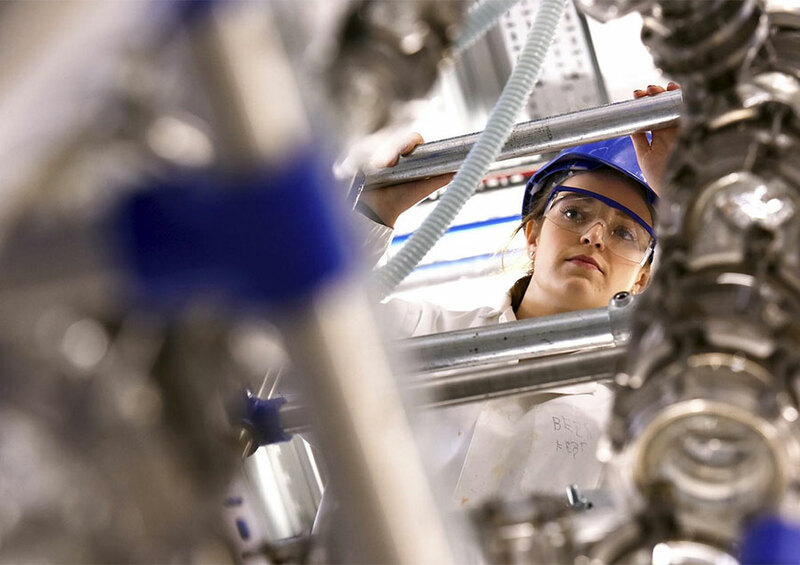 Chemical engineers can be involved in a hugely diverse range of work, from oil and gas extraction to designing and building cleaner nuclear power plants. This degree is accredited by the Institution of Chemical Engineers under licence from the UK regulator, the Engineering Council. Accreditation is a mark of assurance that the degree meets the standards set by the Engineering Council in the UK Standard for Professional Engineering Competence (UK-SPEC). This accredited degree will provide you with the BEng-level underpinning knowledge, understanding and skills for eventual registration as a Chartered Engineer (CEng). Some employers recruit preferentially from accredited degrees, and an accredited degree is likely to be recognised by other countries that are signatories to international accords. In the first year, you study engineering mathematics and fundamental sciences which form the basis for the rest of the programme. 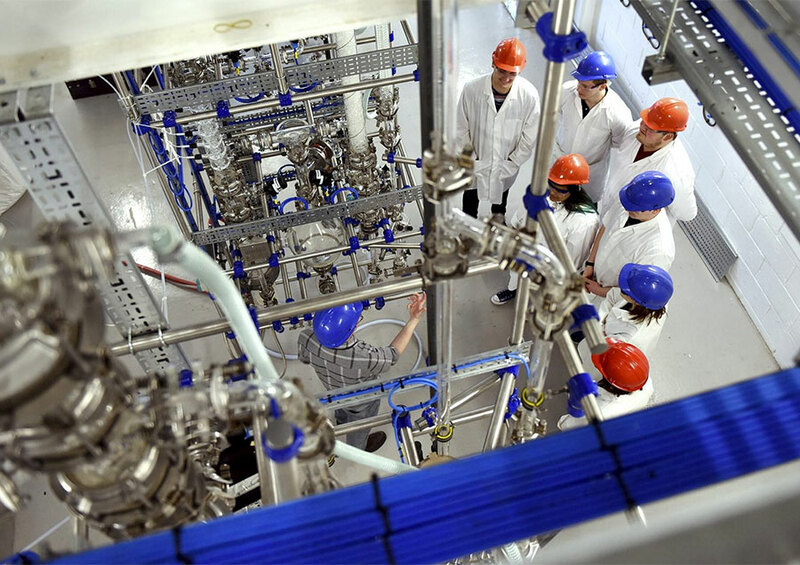 In the second year you learn the principles of chemical and process engineering operations. And in your final year you draw together the skills acquired to produce an overall plant design and expand the knowledge into an advanced area of processing. In addition, the programme develops the skill set and attributes that prepare you for the real world of work. You undertake a series of intensive real-life group projects to enhance your engineering knowledge and skills, and your employability - enhancing skills such as integrity, communication, team working and leadership skills, all highly regarded by employers. This module introduces the range of mathematical skills that are relevant to an engineering degree. You revisit and develop your knowledge of the fundamentals of algebra, trigonometry and basic statistics. The central ideas of vectors, matrices, complex numbers, and differential and integral calculus are also examined. Throughout the module you develop a range of mathematical skills and techniques fundamental to the solution of engineering problems. You also advance your skills in selecting and applying mathematical techniques. This module is delivered through a combination of lectures and tutorial sessions. You gain a fundamental knowledge of fluid flow through pipe-work systems and the associated design tasks. You are introduced to the techniques used to predict the behaviour of fluids in Chemical Engineering applications and investigate the differences between Newtonian and Non-Newtonian fluids. This is one of the most important modules for you. The main tools employed in the analysis of processes involve the use of balances to look at material and energy flow in to and out of the process. You look at the concepts of laws of conservation of mass and energy through a process. You develop strategies for setting up and solving mass and energy balance problems related to chemical and biochemical processes. In addition you look at the use of steam tables for solving energy balance problems. You also study the use of recycles, purges and the limits of conversion in selecting reacting systems as complications that must be dealt with. You work in a team in order to solve a process industry based problem. It gives you an understanding of your own knowledge and limitations and the importance of working with other people to solve a chemical engineering based problem. You gain a fundamental understanding of the operation of the chemical industry with respect to commercial project delivery; health and safety and ethical considerations. This module introduces a range of key concepts in chemistry which provide a basis for understanding subsequent study in areas including analysing, synthesising and identifying compounds, and industrial production. You learn about the nature of matter and why different substances behave the way they do. 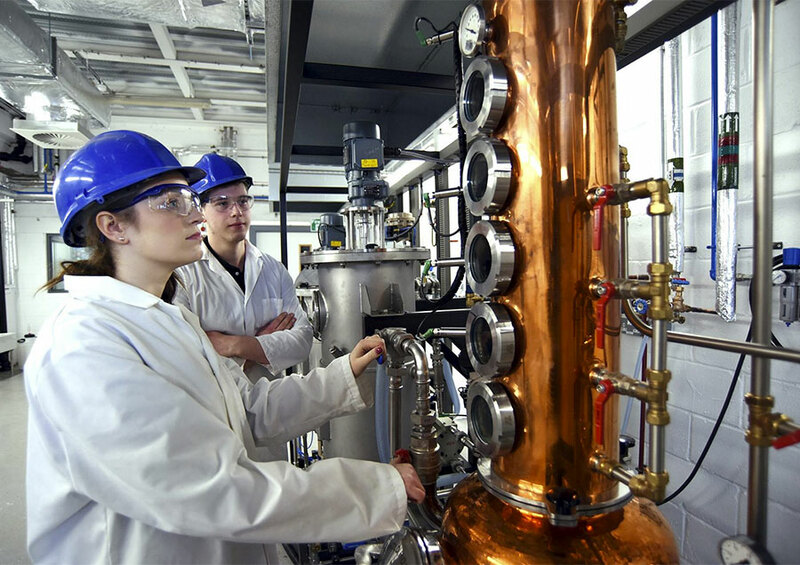 Understanding the properties of a substance is essential whether you’re designing a plant to manufacture it on a multi-tonne scale or working out how to alter its structure to improve its properties, for example as a drug or construction material. You also learn how the fundamental principles of chemical equilibrium, energetics and reaction rate are developed, and come to understand the prediction of reaction behaviour when process conditions are changed. This module provides you with the opportunity to solve industrially relevant process design problems as part of a team. You develop employability skills such as project management, presentation of work, research and commercial awareness to support problem solving in a technical context. You learn about the importance of control systems in industrial production processes, and describe fundamental concepts of linear control including feedback, Proportional-Integral-Derivative (PID) control, system dynamic response and controller tuning. Mathematical modeling of systems based upon rate and balance equations are demonstrated, together with methods of designing feedback controllers. You use computer software to develop models of typical industrial systems and simulate their dynamic response under stated conditions. This module allows you to carry out appropriate experiments in support of mass transfer, heat transfer, reaction engineering and process control. This involves carrying out supervised experiments and producing appropriate reports in an approved format. You make some formal presentations to outline efficient laboratory reporting, error analysis techniques and preparation of risk assessments. In most production units, chemical engineers separate the desired product from the other compounds and concentrate it to give the desired product specification. You gain a sound understanding of mass transfer theory. You learn about mass and energy conservation and particle technology and the basic concepts behind the design and operation of mass-transfer equipment. The core of most chemical processes is a chemical reactor to produce the desired product. Sometimes the components of the reaction may be biologically active. You gain a sound understanding of the fundamental concepts of reaction engineering in chemical and biochemical systems. You make use of the essential knowledge of mass and energy conservation, reaction equilibria and kinetics and are introduced to the basic concepts behind the design of different types of chemical and biochemical reactors. You broaden your knowledge and deepen your understanding of process unit operations and the underpinning science. It provides you with design methodologies for complex unit operations involving multicomponent distillation, liquid-liquid extraction, gas absorption, membrane processes and chromatography. You gain an in-depth understanding of the application of thermodynamics to mixtures. A group work project-approach addresses the impact of industrial and human activities on the environment and the need for a sustainable approach to future developments. You specifically consider sustainable remediation strategies for air, water and land pollution and alternative fuel and energy technologies towards zero carbon emission. This module addresses key concepts and skills essential for an exploration of environment and sustainability. It also instils a broad and deep understanding of environmental problems. You are assessed by a group poster presentation (40%) and an academic paper (60%). Individual marks for this piece of group work are moderated according to evidence of your engagement with the process, including self and peer assessment. You develop your understanding of reaction engineering and apply your knowledge to complex and multi-phase reactions/reactors systems. 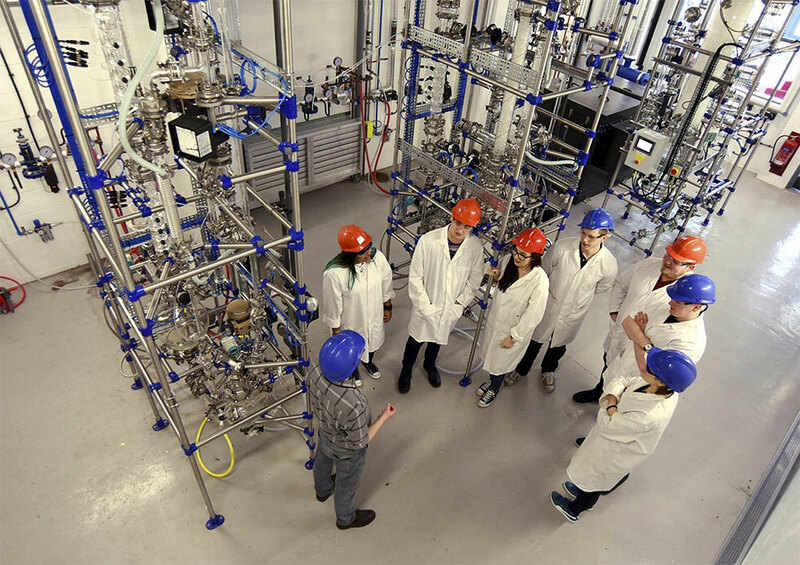 You are also introduced to catalyst preparation and characterisation, and the use of catalysis in reaction engineering. You attend a range of lectures, small-group tutorials and hands-on laboratory sessions. Some of your learning is based around case studies, following visits to local industries. A theme of process design through group work runs through all stages of the course. Your programme includes a range of assessments, including coursework assignments, project reports and formal examinations. Your offer will be made on the basis of your UCAS application and, if appropriate, your interview. UCAS tariff points: 96-112 UCAS tariff points from any combination of recognised Level 3 qualifications including mathematics. The preferred second subject is chemistry, but alternatives can be considered. If you have not studied chemistry at Level 3, then we provide additional non-credit bearing chemistry tutorials during your first year on the degree to help you learn the key chemistry topics you will need. 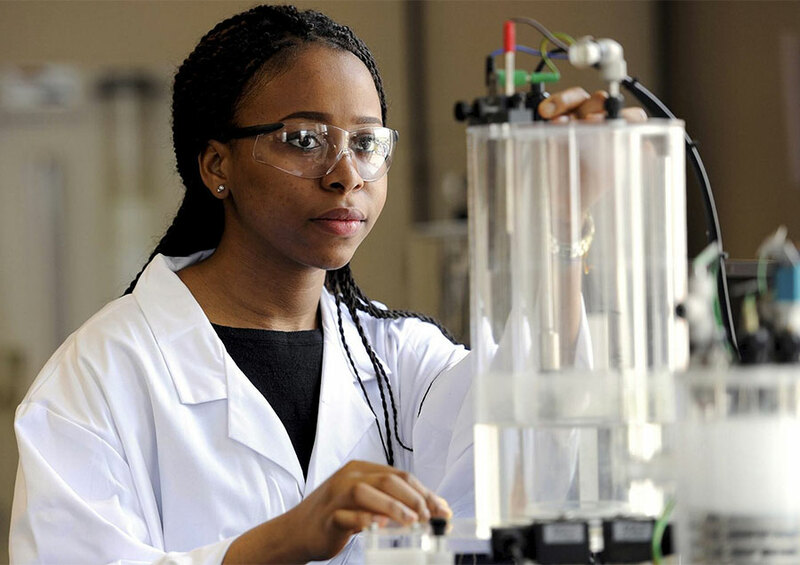 We also offer free study of foundation chemistry as part of our Summer University programme. You can study one of more subjects as part of Summer University over a six week period after you complete your current Level 3 qualification. If the qualification for which you are studying isn’t listed, please contact our admissions team for advice on eligibility. Eligible applicants are normally invited for interview. The interview is to determine each applicant’s potential to succeed and to help us set appropriate entry conditions matched to personal circumstances and the demands of the course. The interview also enables you to see our excellent facilities, meet staff and students, and to learn more about studying at Teesside University. We encourage all applicants to attend an interview, but if you are unable to attend an interview we may consider your application based on your UCAS application alone. Online or skype interviews may be possible in some cases. You are expected to have at least Level 2 literacy and numeracy skills. Typically, GCSEs in English language and mathematics at grade 4, or passes in Level 2 Functional Skills. Non-EU international students who need a student visa to study in the UK should check our web pages on UKVI-compliant English language requirements. The University also provides pre-sessional English language courses to help you meet the English language requirements. We may be able to help you meet the requirements for admission by offering you the opportunity to study one or more Summer University modules, some of which can be studied by distance learning. Our degree courses with an integrated foundation year provide an alternative entry route for students who haven’t studied the mandatory subjects or who have grades below those required for Year 1 entry. Applicants with previous study and qualified to BTEC Higher National Certificate (HNC) or BTEC Higher National Diploma (HND) level, or equivalent, may request direct entry to Year 2 of this degree. You will be required to provide a full detailed transcript of your previous studies with your application to enable us to determine your eligibility for advanced entry. Chemical engineers are employed worldwide in activities including research and development, design and plant operation. They are involved in a wide range of sectors including the utilities, construction, defence, chemicals, oil and pharmaceuticals. Working as a chemical engineer. 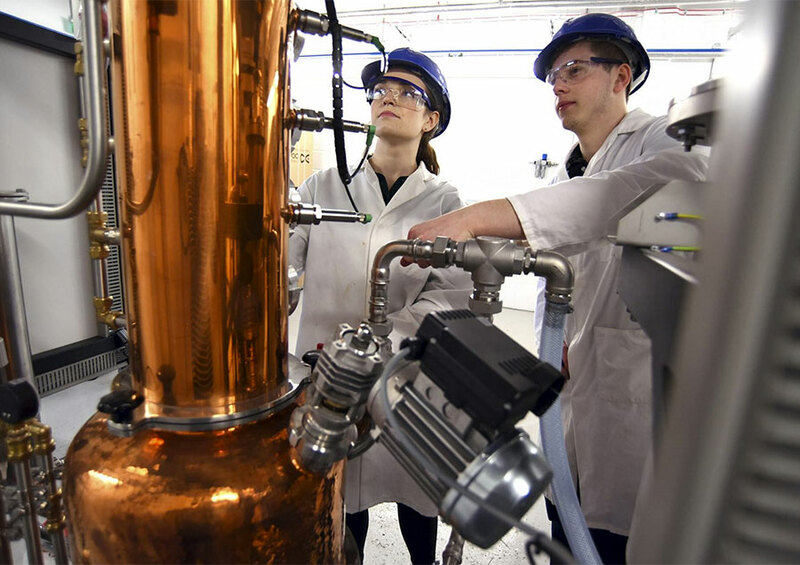 Find out more about our chemical engineering courses, specialist facilities and hear from our students and staff. After completing a first degree and PhD, Andrew has had a successful career in chemical engineering. Stephanie came from Nigeria to study here. Nuria is now working as a Graduate Reliability Engineer for Cummins.